The most difficult part of opening your doors for love again is welcoming it with trust. Truly, once broken, trust is so hard to regain. But, why is it also so difficult to trust another person? I think it’s because once we are broken, we also gain fear. Fear that the same thing would happen all over again, smiling, laughing and unfortunately crying because of a certain someone. Maybe that’s why we lock our hearts so firmly that sometimes we are just the ones depriving ourselves of healing or maybe we are actually already healed but we don’t know because we’re so busy isolating ourselves. If the latter happens, how would we actually know if we’re already fine? I actually don’t know. But I think it just really comes so unexpectedly and it is actually so beautiful. Going out is okay. But going out with your bestfriend is risky, probably the riskiest. As I reminisce about how our love started, I shed tears of joy. Our first date was so casual but, it was so fun. I didn’t even notice how much I’ve enjoyed it. It surprisingly turned out to be something both of us could not even explain but we both knew it was a possibility of love. Through these months, we’ve made sure we enjoy each other’s company. Sometimes you would say it’s like we’ve been together for years but I think it was just because you were my best friend for almost eight years now. Actually, I really don’t know. Maybe you were right. Less than a year of dating but you’ve always felt like home. For the past few years, I’d see you during vacations for simple dinners. This year, I saw you almost every single day. You’ve made me get used to everydates. I just don’t know how to get through a day without even getting a hug from you. You tried to know me more even after these years and most especially, even after you knew you actually love me. But I also did. And it actually made me appreciate you more. Life’s crazy playing on me because all this time it was just you. As I enjoy everything that comes within the package of your love, I thank you for sharing the same faith with me, making sure you know my kind of food, trying to make things so much easier for me, introducing me to such a wonderful family, being a kuya to my siblings, loving me during the hardest of times, crying on my shoulders when you’re sad, telling me why you are mad, sharing your stories most especially when you are glad, learning my body language and for simply just being there for me all the time. Who would have thought? Everyday I look at you, I thank God for giving me this kind of love. Something I prayed for and I’d gladly dedicate this heart for that I isolated for years. You came just in time for this beautiful love that is actually grown from the same love I showered myself with for the past few years. Now, I’m ready to share it with you. You are everything. My confidante, my other half, and my bestfriend. Benedict, you are such a wonderful gift that I continuously pray for every single day. To say that I enjoyed my internship at AFPMC is definitely an understatement. Even if it was too exhausting, making me sick atleast every other week, I honestly never ditched a duty just because I was feeling lazy. Why would I wanna miss it if I have postmates that give me the exact meaning of fun and teamwork combined, staffs that don’t treat you as mere subordinates but as family, groupmates you can call home and most importantly, my partners (Fatma, Meds, Marion and Kylene) that give me the best company anyone could ask for? For the past five months, I have gone far beyond of what I have been expecting from my own being. I was able to pull off things I never dreamt of doing. I have learned new things and have been driven further. But most importantly, nothing is more satisfying than being given the chance to payback to those who serve so that others may live. To our living heroes, a snappy salute! This is my first time to go to a concert of an international artist. I am not really that type of person who’s gonna spend money on such things. But, since I promised my sister I’ll accompany her, I did spend bucks. And, I am also a fan of Ed naman so it’s fine. Some of his songs were on my favorite’s playlist. 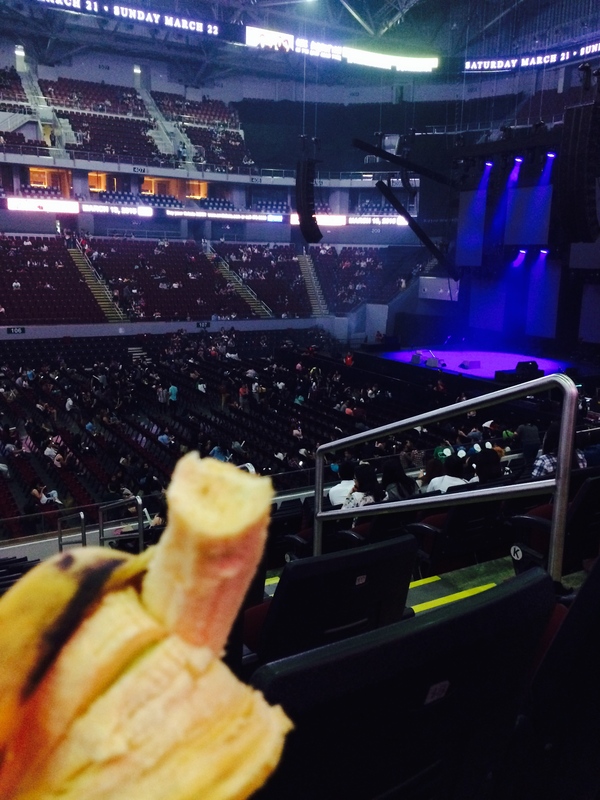 My sister wasn’t able to get some tickets for One Direction’s concert so we went here instead. But I may say, this isn’t really just a consolation cause she loves Ed as well. March 12 is a Thursday, a class day. My sister came all the way from Lipa just to see him. My parents, the usual supportive couple, drove her to Manila. As soon as I was dismissed, I took a UV Express from UST to MOA and met them at the parking. We arrived quite early so we had enough time to eat. I actually brought 2 bananas with me. I am trying to eat healthy food. HAHAHA. It might have looked weird from other’s perspective. Most of the people around me were munching on popcorns and doughnuts. They had Krispy Kreme inside and Starbucks too. I was supposed to get myself a cup of coffee but the line was too long. My sister and I weren’t lucky enough to get seats beside each other. As you can see I was seated in a row behind hers. 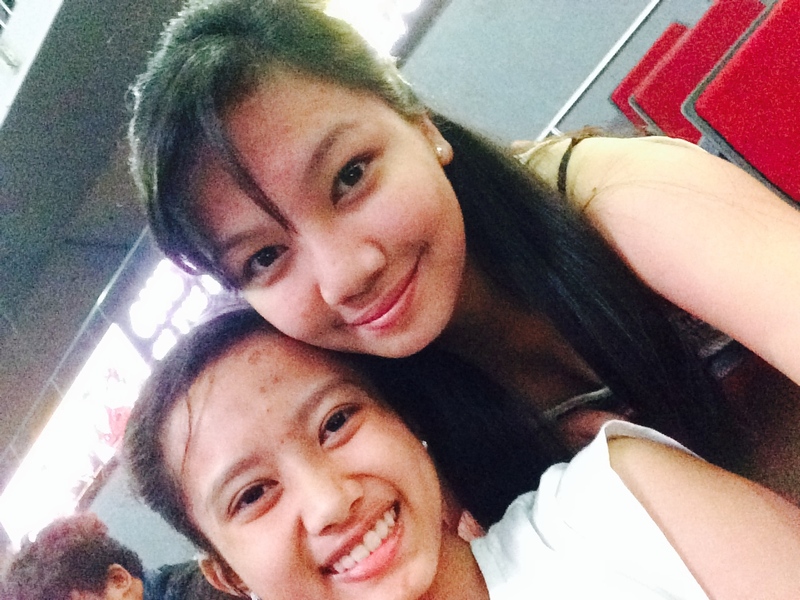 But, before the show started, we discovered that girl beside me was with the other girl beside my sister. So, Bert decided to give her seat to the one beside me and took the latter’s instead. The show was really good. I am really bad with lyrics but the feels was there, atleast diba. HAHA. I was really tired and sleepy since it was a whole school day so, I didn’t have the fully charged body that I have observed from the others around me. Everyone was enjoying and I tried to get along. But, a part of me just wanna lay down and sleep and wait for the show to finish. I took some videos of my favorite songs. We weren’t able to get the VIP tix for they were sold out already. But, I just realized that our place was better compared to others from the VIP section. The whole floor (which is converted to a court during basketball games) was intended for the VIPs and sadly, those who were given the farthest seats didn’t seem to really get the VIP experience. I am sure we got a better view from where we were that night compared to them. The show lasted for almost two hours. My parents took me back to my dorm before they went back home to Lipa again. It was really one for the books! It actually changed my view of spending money on concerts. But, the struggle in saving money is really real. However, if given the chance, I’ll surely go to another concert, maybe Taylor Swift’s or Michael Buble’s?